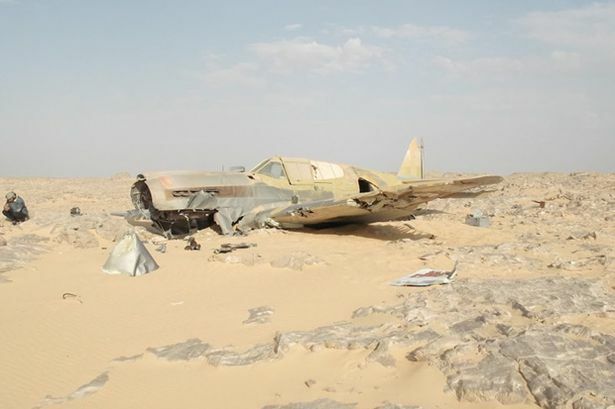 Okay, let's look at the famous Kittyhawk P-40 in the Sahara. This is a fairly recent find, and most readers are probably familiar with it. I figured I'd put up a page about it anyway, for those interested in World War II wrecks. I've learned a bit about it that you may find interesting. A perfectly preserved Curtiss P-40 Kittyhawk was found in Sahara Desert in May 2012, when Polish oil worker Jakub Perka found it while on expedition in Al Wadi al Jadidi. The Kittyhawk, built in Buffalo, New York, was untouched from the day it crashed during World War II. There is no evidence anyone else laid eyes on it throughout that time. 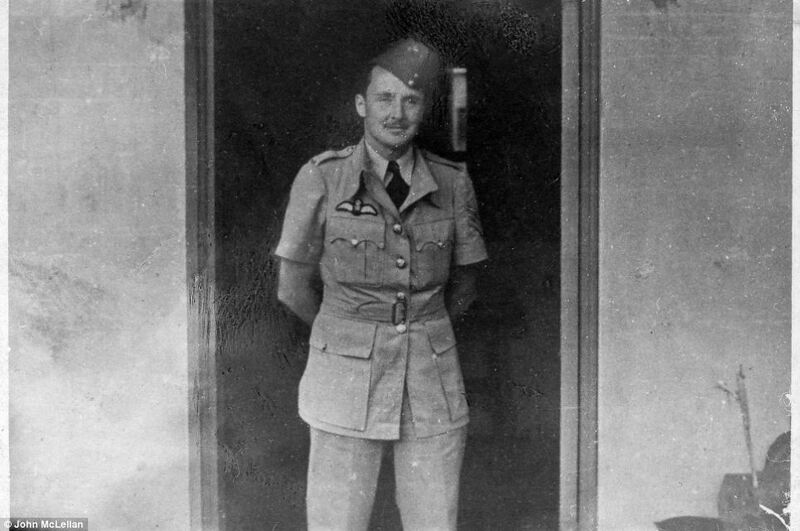 Flight Sergeant Denis Copping in his RAF uniform aged 24, shortly before he went missing in the desert. It is widely believed that it was the plane of 24-year-old Flt. Sgt. Dennis Copping of RAF No. 260 Squadron. He was from Southend-on-Sea, Essex. Copping's flight path. 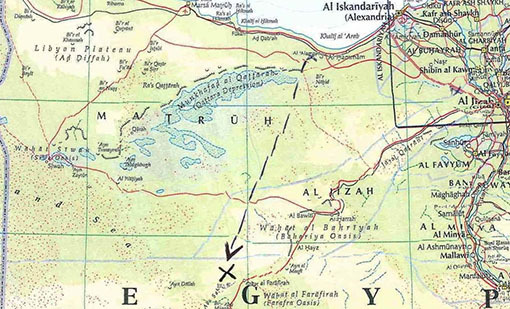 German General Erwin Rommel's Afrika Korps would have been standing on the coast directly to the north when the plane went down - marked by the "X." 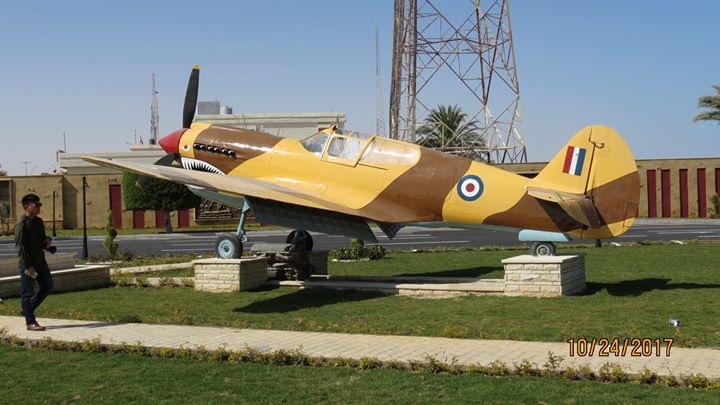 On June 28, 1942, Copping was tasked by 260 Squadron to ferry the damaged aircraft from one RAF base in Egypt to another for repairs. He wound up flying to the southwest, away from coast and Nile, into the middle of nothingness. Perhaps needless to say, that was not the direction of his intended destination, and it is of course a mystery why he went that way. Getting lost in the featureless desert is a common hazard, especially if your compass or other directional gear stops working. There would have been no landmarks, just sand and featureless ridges. Copping was far off course, perhaps disoriented, perhaps chased by the Luftwaffe (the switch for his guns was in the "On" position) - there is no way to know. A fellow pilot is said to have tried to get his attention as to his wrong course with hand signals, to no avail. 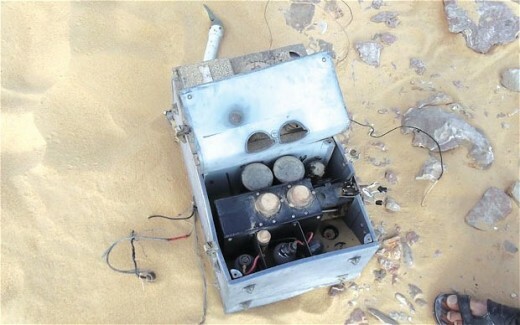 Likely, his radio wasn't working - as noted, the plane was due for repair, so could have had any number of defects. 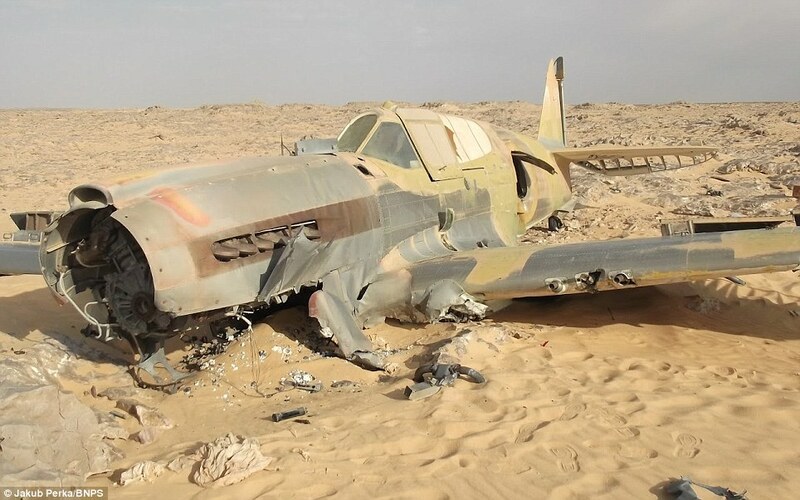 Ultimately, Copping and his aircraft disappeared into the endless desert. The gunsight is that large black protruding thing at the top. It is assumed that Copping lost his way, perhaps ran low on fuel, and decided that crash-landing relatively intact was better than waiting until he had to bail out. Again, everything but the wreck is guesswork. 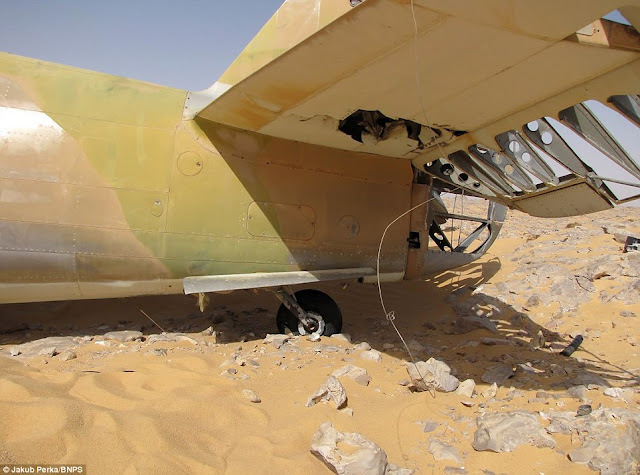 He chose a rocky ridge with a thin covering of sand above the floor of the desert, perhaps because it would be easier to spot his plane from the air there (but more difficult from the floor of the desert, perhaps accounting for how long it took to find). Copping made a good landing, wheels up (contrary to initial reports - pictures of the crashed plane show the landing gear switch in the "retract" position). The landing gear, even though retracted, sheared off as the plane landed, it must have been tough to judge the rocky terrain from the air. It also must have been quite a bumpy landing as the radiator and propeller came off as well. Copping survived the crash and got out in good shape, that much we do know. There he stood, alone, surrounded by sand and rocks and wind. 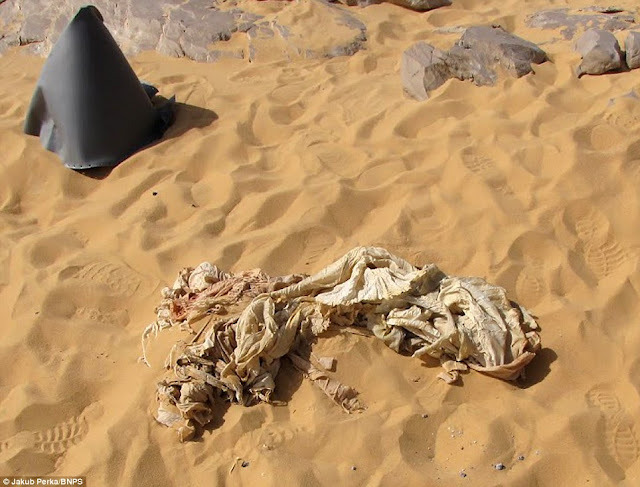 A parachute in the sand. Where else in the world would you find something like that. Next, Copping used his silk parachute to shield himself from the sun and perhaps attract attention. 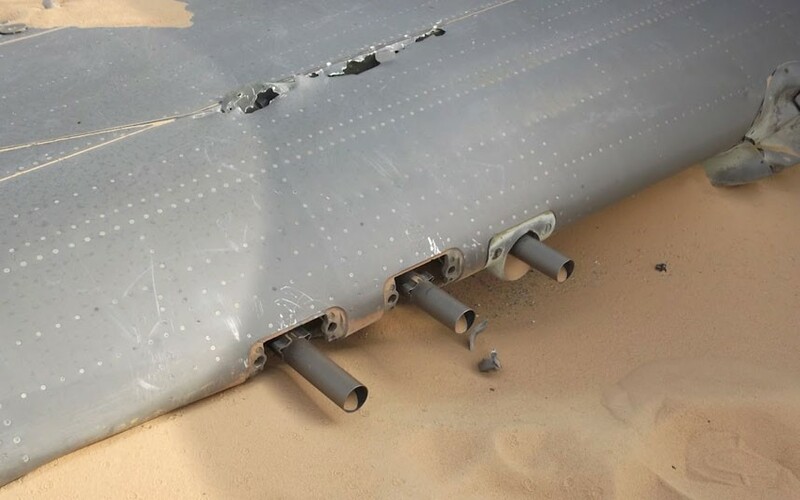 One can imagine that he spent some time with the aircraft, hoping that someone would come looking for him and knowing it was wiser to stay with the relatively visible plane (just as it is safer to stay with a capsized boat, the desert and the ocean have a lot of similarities). Ferry pilots did not carry much in the way of water or rations, though there would have been a bit of both stored in the plane for such emergencies. 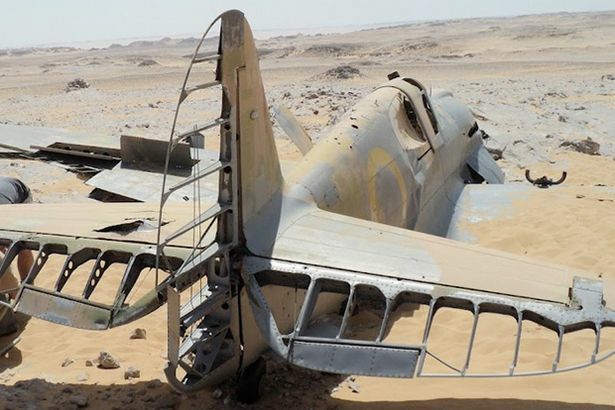 The odds of being spotted from the air - assuming anyone was looking for him, not a certainty in the middle of a war - were greatly lessened by the fact that the plane's desert camouflage made it blend into the surroundings. Copping took the radio out. Perhaps it didn't work, or maybe he was out of range, or perhaps he had no battery power to run it. Eventually, Copping left it and the plane behind and started walking. What else could he do? To stay was certain death. Of course, walking aimlessly without any way of knowing which way to go also wasn't exactly promising - but what can you do? What can you do? The nearest settlement, it turns out (Copping wouldn't have known this) was 180 miles away to the North. Even if Copping had a full pack of water and rations and a camel, it still would have been a miracle to find it in the featureless desert. The Nile was even further away to the East. Still further north, the British Army was fully occupied with containing German General Erwin Rommel, who was preparing to launch another offensive. If the Germans spotted him, either from the air or ground, they might have just shot him. So, the odds weren't exactly in Copping's favor. 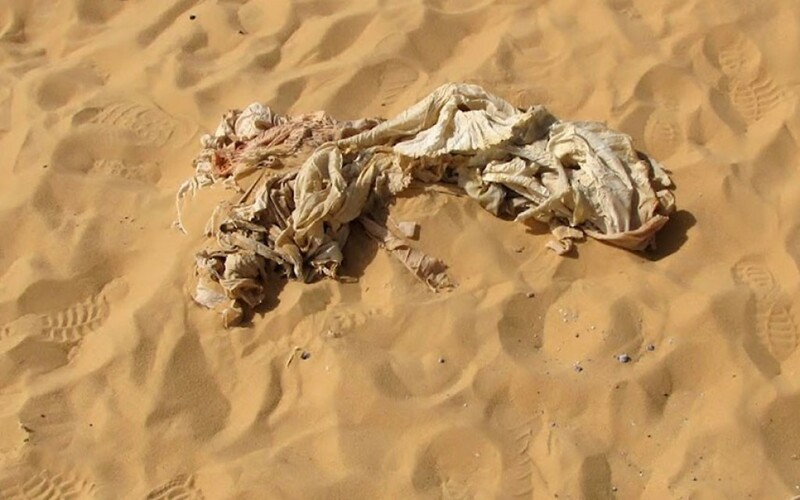 Worth another look: incredibly, 70 years later, Copping's parachute remains intact exactly where he left it to walk off to his death in the desert. The British Army did not make much of a search, but that is understandable given the situation. Where to start? He could have been anywhere. Even a full-scale effort would probably have been fruitless, especially given the plane's desert camouflage. There was a war on, men died every day, and aircraft got shot down or crashed on their own. Flt. Lt. Copping was not a top priority, in fact, he was not a priority at all. He did get a grave marker, Column 249 at the Alamein Memorial, with date of death listed as that of his disappearance. So, seventy years passed before the plane was found, which gives some idea of how likely it would have been for anyone to find it in 1942. 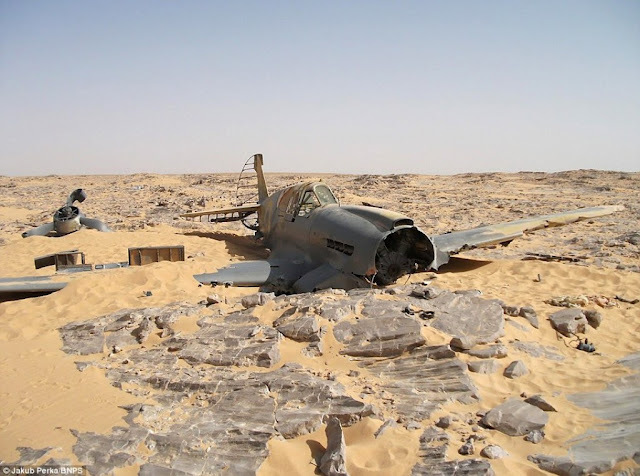 While the American-built Kittyhawk was in amazing condition considering the passage of time, the remains of Flt. Sgt. Copping were nowhere to be found. All that could be said was that he wasn't at the plane. If you look closely, you will notice that the camouflage paint is gone from the front of the plane, with original US Army olive green undercoating exposed, but not the rear. Copping went by the book and landed into the wind. The prevailing winds in the desert seldom change, so, over 70 years, the wind scoured the front of the Kittyhawk clean but left the rear intact. Later, though, a search team (ARIDO) found a pile of human bones, a parachute, metal buttons dated from 1939 and some other items a scant few miles from the crash site. They were in an alcove of a large rocky formation - whoever it was sought shelter from the wind and sun. 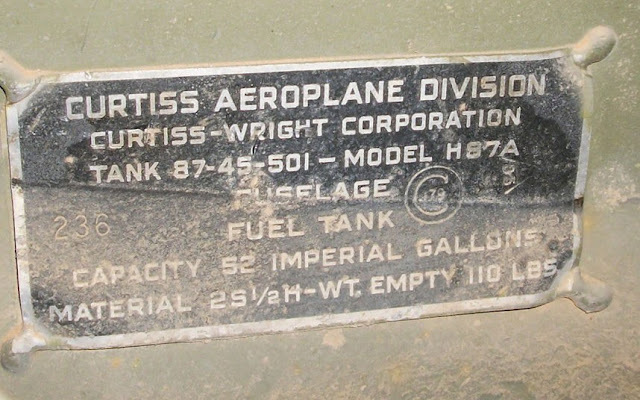 The remains were identified by the finders as those of Flt. Lt. Copping, but that is only a tentative identification and, according to the British Ministry of Defence, they were not those of Copping at all. 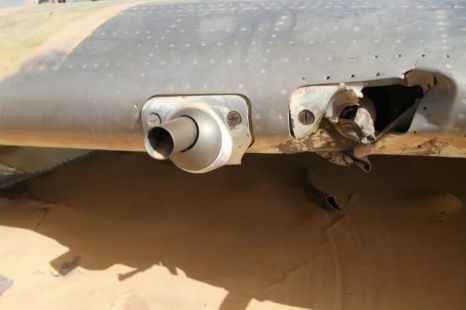 If it was Copping, he didn't get very far - contrary to how it may seem from pictures, walking a mile in the sand isn't easy at all, especially in flight gear with no water and no... nothing. 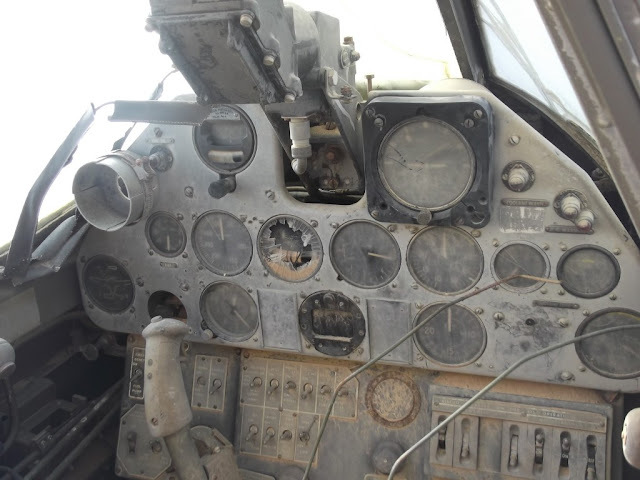 Plus, Copping probably was near death when he started out anyway, having waited by the plane for as long as he could stand, trying to get his radio working. Not knowing where he was, he perhaps figured to give it a shot with a walk at night - maybe there was a town right across the next ridge, or a camel train, or anything. There wasn't. 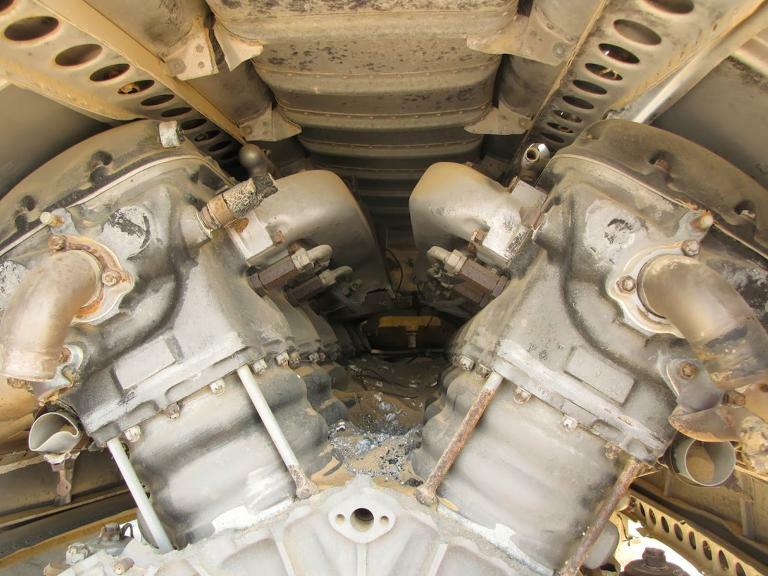 The very powerful Packard V-1650 Merlin engine. Get a good mechanic with hoses, fuel and plugs and so forth, vacuum out the sand, and that baby would start right up. The bones that were found nearby and believed to be Copping's are now said to be in a box in Cairo (everything about this is murky, with conflicting statements), but nobody has put forth the effort to identify them via DNA or any other means aside from the few surviving items beside them. Meanwhile, the RAF Museum at Hendon got the Ministry of Defence - it is still British property - to deed it to it. 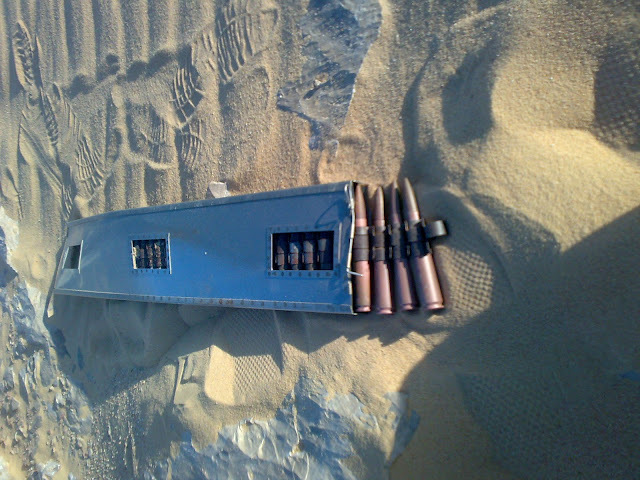 However, the Kittyhawk is understood to be in the possession of Egyptian authorities in a storage crate at El Alemain. Everything is said to be inaccessible due to politics, but it sounds to some as if the real problem is that pilot Copping once again is not a priority. The guns and ammo remained in the plane - the Egyptian Army since has seized them because - 70 years later - they could still be used. The plot thickens a bit when you get into the weeds. The Hendon RAF Museum promised one of its rare Supermarine Spitfires (only 110 are left in Great Britain) to the Essex-based Kennet salvage team as “payment” for the Kittyhawk salvage job, and accordingly the museum transferred title of the Spitfire to the private firm. However, the unrest in Egypt has prevented consummation of the deal, though the plane wound up in a storage container. Salvaging the remains of the Kittyhawk. The P-40 may never make its way to England, while the Spitfire also is lost to the public for the duration. The whole affair remains "up in the air." It inevitably will work itself out, but for now, the swap remains a bungled situation. If it ever works out, the Kittyhawk may wind up restored at the RAF Museum in North London. There isn't much further news about this incident that I could find. News items like this tend to have their 15 minutes in the international media - National Geographic was all over this with its usual brilliant photographs - and then disappear into local media, if that. Hopefully, the plane will find its way to the Hendon museum, and Flight Sergeant Copping - if that is who it is - will find a proper burial. The restoration would be straightforward, as the plane is in good condition. That isn't the real issue, though - there are plenty of P-40s left. Returning this honored treasure to England just is the right thing to do. 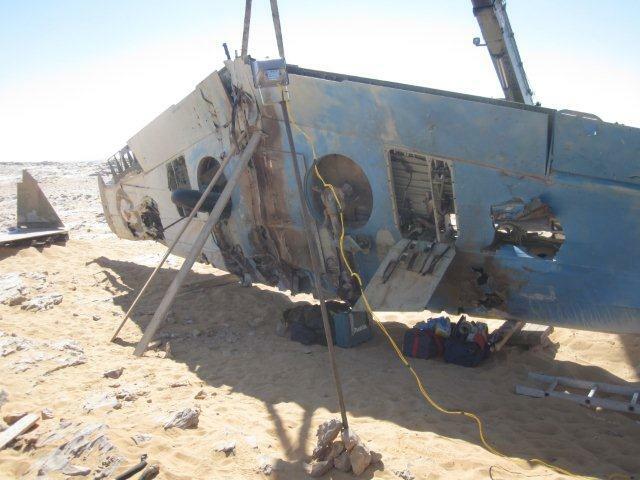 Update: Word is that the plane has been somewhat restored and is on display at the El Alamein museum. I do not have confirmation, but supposedly this is the plane, "restored." However, I don't have confirmation that it is the same plane, and, if it is, there is no word on why it hasn't been sent to the museum in London. Obviously, if the plane pictured above is Copping's plane, that is a travesty.